The other day, my sister asked me to bring her home a bag of oats from the market so that she could make granola. I was inspired. 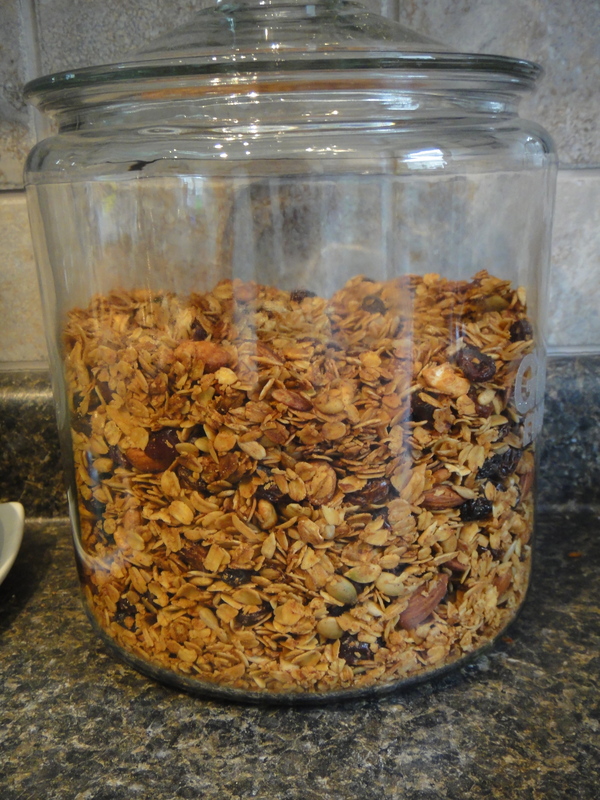 Why have I never made homemade granola before? It seems so easy, and this way, you can control how much sugar is in it! 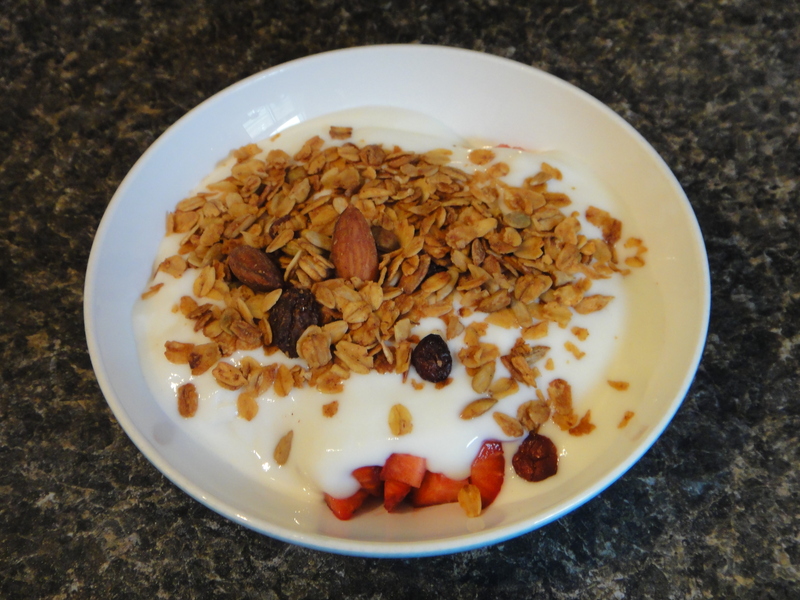 So, I scoured the internet for a good granola recipe, and what did I find but a recipe for Country Inn Granola from none other than the happy Canadian Giant, Michael Smith himself. Now I had two sources of inspiration. I used traditional oats from Gold Forest Grains. These oats have larger flakes, as compared to the quick cooking instant oats that Gold Forest also carries, so they’re perfect for Granola! 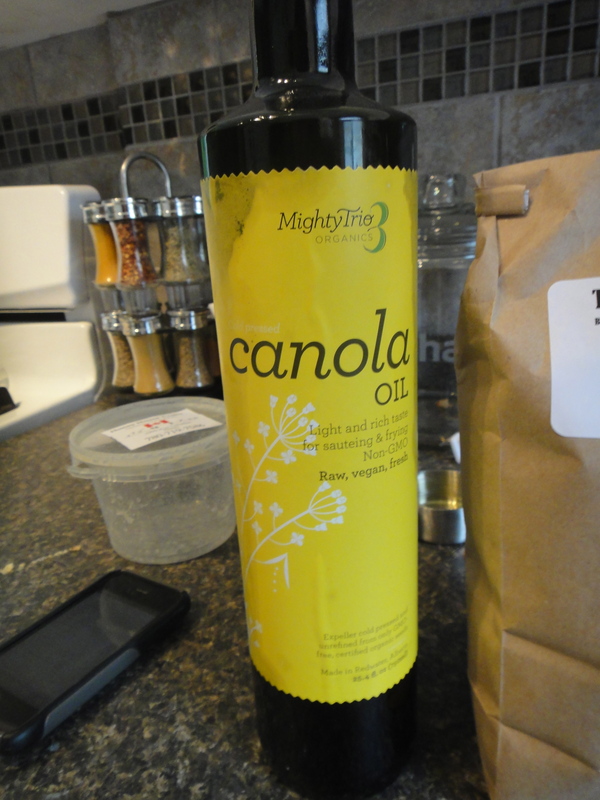 The recipe also called for vegetable oil, so I used mighty trio‘s canola oil. It’s always a favourite! For this recipe, you combine the honey, cinnamon, nutmeg, vanilla and oil on the stove and heat it until the honey melts. Next, you combine all the dry ingredients in a bowl. Pour the wet ingredients into the dry and coat well. 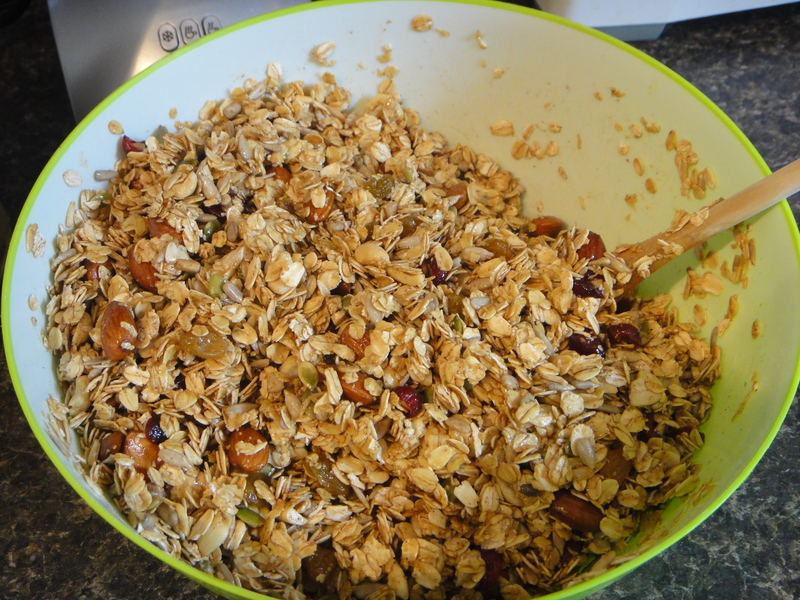 Dump the whole thing into a baking dish and get ready to toast and roast your granola for a while. Preheat your oven to a gentle browning temperature—325°F (160°C)—hot enough to toast the granola but not hot enough to burn it. Pour the honey, oil, cinnamon, nutmeg and vanilla into a saucepan and bring them to a simmer over medium heat. 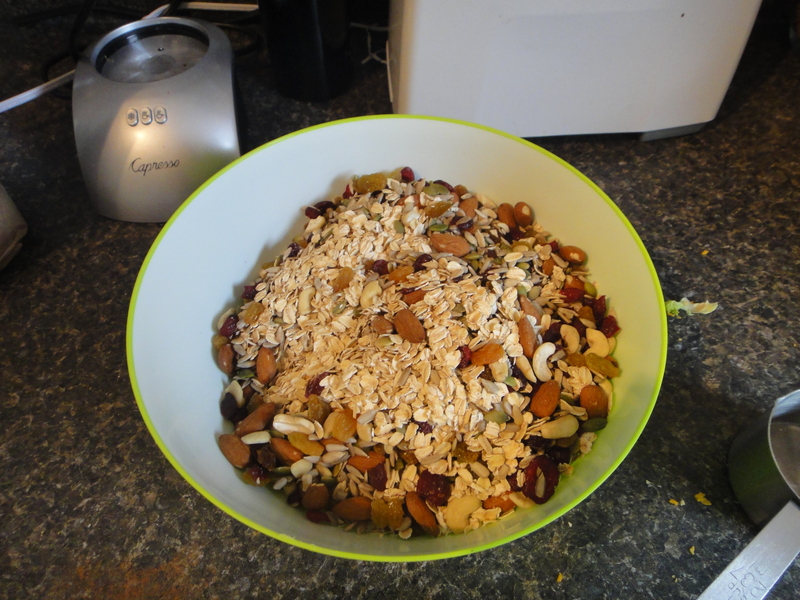 Toss together the oats, sunflower seeds, almonds (or trail mix) until they’re evenly combined. 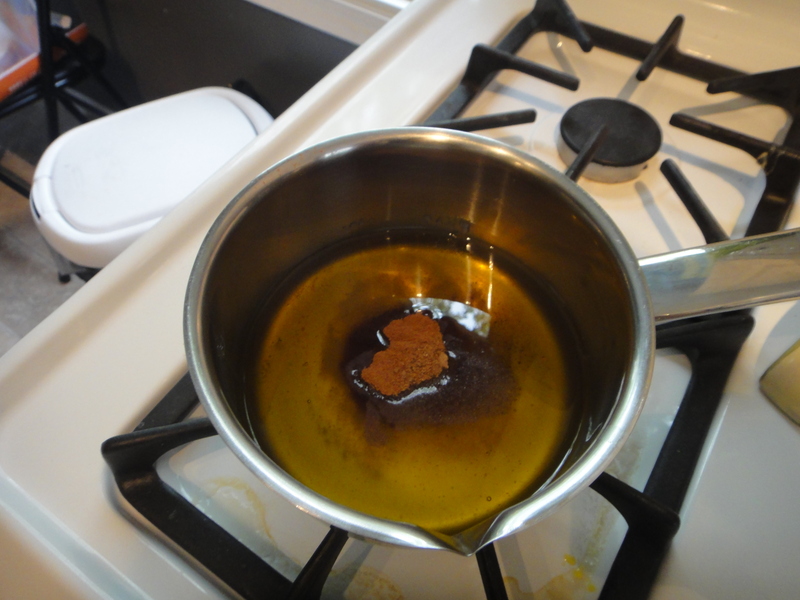 When the oil mixture is hot enough to simmer, pour it over the dry ingredient mixture. Stir well until everything is evenly coated. 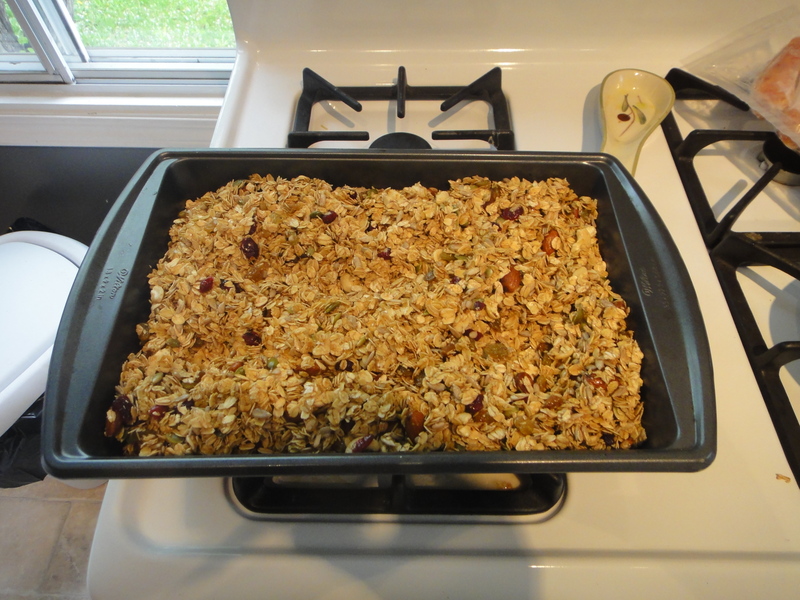 Spread the raw granola into a single even layer on a rimmed baking sheet or two. Bake for 40 minutes or so, until the oats are evenly toasted. Every 10 minutes or so, stir the works to help it cook evenly. 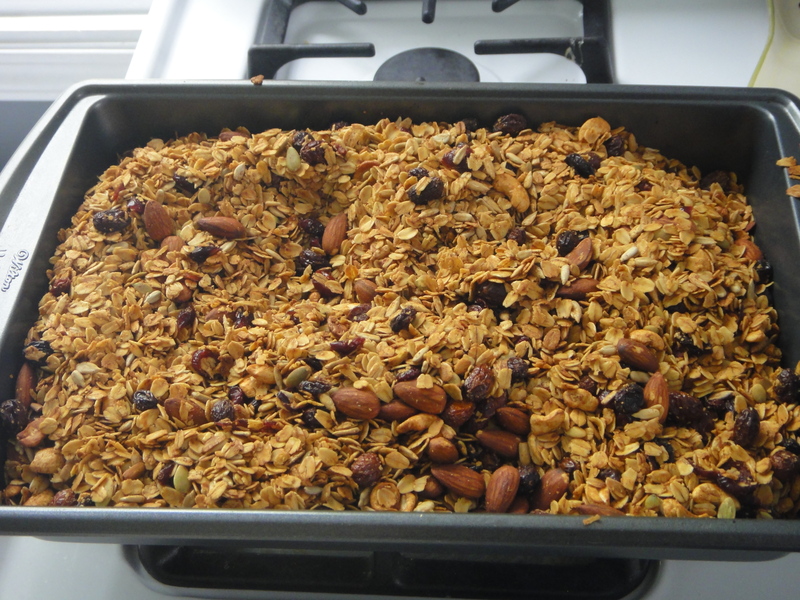 Continue baking and stirring until the granola is baked golden brown. Rest at room temperature until completely cool, then stir in the raisins (or cranberries).